My calves were ultra-tight and sore from the 10K. My feet were okay (still wearing the "barefoot" shoes for running) but my legs definitely were smoked from the run. 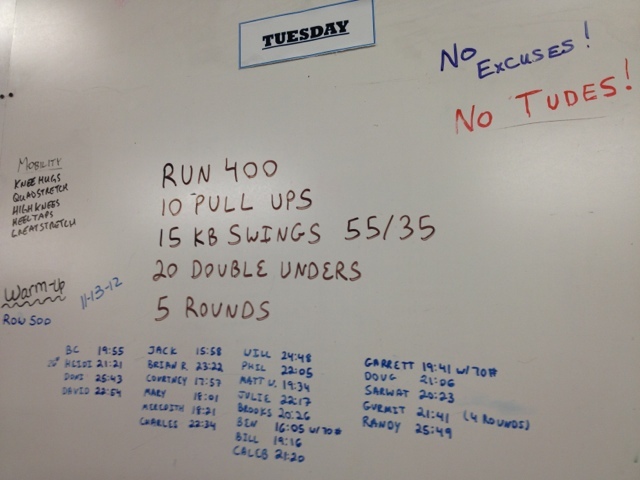 That didn't stop me from doing a WOD in the morning (it actually helped). This means that in the first couple of rounds, I did do more reps of each exercise but got smoked and then tried to maintain. The pushups and the box jumps are the hardest for me. Pushups because I still have poor upper body strength and box jumps because I have reverted to how I felt about them when I first started Crossfit: terrified. The first couple rounds, I couldn't convince my legs that they could jump on the big tire (I wasn't even mentally ready for wooden box! ), so I did step ups. But I persevered and did jumps in the last 3 rounds. I just need to keep doing them. That evening I went to my swim lesson and learned all about the breast stroke which was too hard for me to actually do for more than 3 strokes. I went back to practicing the freestyle stroke and treading water. I was able to tread for 30 seconds! Progress is slow in swimming but I'm feeling more comfortable in the water. Glad I went, the pullups were better, I think I'm actually kipping a bit. Double unders are non-existent for me. I have a cool speed rope from Rogue that I never use, and I probably should bring it and try. I might get a couple done then. I got up to 83 lbs and just mentally couldn't get past it, and it didn't help that my lower back still is sore a bit. So 83 lbs was pretty good. I have a video clip and in this one, I did a very poor "jerk", since I pressed out the weight. 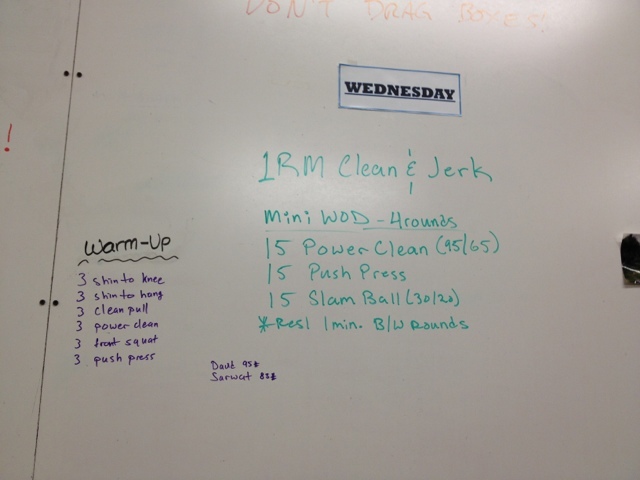 For the record, I can do a decent jerk, just didn't get it on camera. I did attempt to do this at 65 lbs but after the first round of power cleans, I was too spent to get the bar up for push presses so I dropped the weight to 55 lbs. I went to my last swim class and am feeling better about my abilities. I still have much to practice but treading is getting easier and my breathing is better on the freestyle. I am really glad I took this class and will continue to practice swimming! 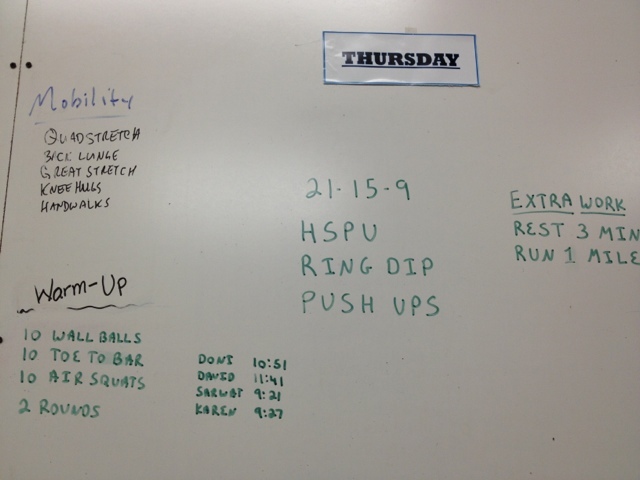 Even modified, my arms and shoulders were spent and I was a little annoyed that the WOD had handstand pushups and regular pushups in it. I didn't see the point of it but there is probably a reason (I hope). 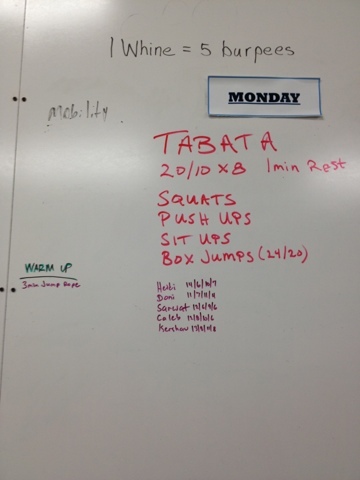 This actually did turn out to be a mini-WOD for me (my definition is < 10 minutes). I bailed on the "extra work" since I had to get to work early.